When attempting to determine the chain of events which occurred in a vehicular collision, learning the whether the in-car lamps are lighted or unlighted at time of impact is extremely helpful. Filaments of incandescent lamps often provide the key, because filaments are made of tungsten and stresses generated on them by the forces associated with a collision produce deformation and fracture phenomena with characteristic differences between hot and cold filaments. Further evidence may also arise if the glass bulb is broken during the accident. 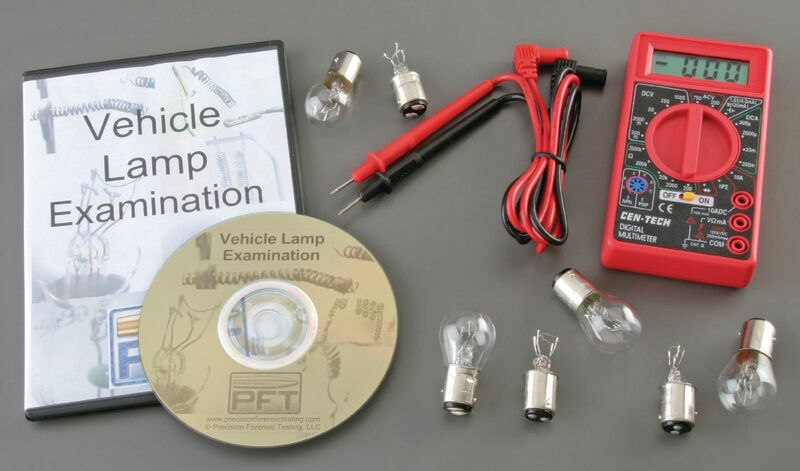 The lamp samples included with this kit walk students through the procedures of vehicle lamp analysis. The samples have been broken under various circumstances and allow students to examine actual evidence. Worksheets included with the kit will help students report their findings. One unbroken standard car lamp, a voltmeter, and a detailed PowerPoint lecture exploring the characteristics associated with lamps involved in accidents are also included.